90+ Acre Ranch directamente para o rio Elk No Coração das Montanhas Rochosas canadenses! Se você está procurando uma autêntica experiência de montanha rochosa em uma fazenda histórica, com privacidade, esqui de classe mundial por perto e pesca da mosca seca à sua porta, abundante vida selvagem, e todos os confortos de casa, você encontrou-o. Construído em 1906, o Elk River Lodge é decorado com 10 camas de luxo, cozinha com qualidade de revista, banheira de hidromassagem, novo barril de cedro ao ar livre Sauna!, churrasqueira ao ar livre e vistas de todos os quartos. Ideal para reuniões de família, esqui de classe mundial e pesca com mosca seca, cavalgadas, observação da vida selvagem, snowmobile, o lodge se sente como se seu em um parque nacional que é todo seu! Rebanhos de alces e veados pastam no meio do campo a cada dia. A propriedade faz fronteira com o Rio Elk oferecendo milhas de classe mundial pesca da mosca seca em total privacidade e uma bela Spring Creek flui ao lado do lodge. Muitos outros riachos cheios de trutas estão por perto. Nós corremos um rancho de trabalho autêntico que aborda cavalos e é idealmente configurado para Bed and Bale também! Traga suas hastes de mosca ou esquis, câmera, botas de caminhada e até mesmo seus cavalos! Há um fogão a lenha grande na sala grande com abundância de corte de lenha à sua disposição, uma mesa de pebolim e antigo jogador record estilo com uma bela coleção de vinis antigos, uma televisão escondida com uma coleção de filmes, e uma fogueira do lado de fora para assar marshmallows enquanto escuta a corneta alces. O alojamento está idealmente localizado para fazer passeios de um dia para os parques nacionais circundantes, incluindo Banff, Waterton e Glacier, bem como os parques provinciais, incluindo Elk Lakes e Altura das Montanhas Rochosas. Elk River Lodge oferece a melhor maneira de experimentar o esplendor das Montanhas Rochosas canadenses, como Montana costumava ser há 100 anos, apenas melhor. Pesca com mosca, esqui, skidoing, caça, ou simplesmente relaxar em um belo lugar confortável carregado com vida selvagem e paisagens incríveis, é isso. If you are looking for a place to stay while you hike, ski, fish or just unwind this place is for you. When my friends and I arrived we were absolutely blown away by the location and the decor of the cabin, it was unlike any other place I stayed at before. They have just about everything in order to make your stay nothing short of amazing. From spacious bedrooms, giant dining room, fully stocked kitchen, comfortable living room, hot tub and a brand new sauna to mention a few. I can tell that the owner put in alot of hard work to maintain this nearly 100 year old cabin and it definitely shows. All and all this place was perfect for a relaxing getaway with my friends and I highly recommended it. Can't say enough about our experience renting this property. Jason was accommodating from the beginning making sure that our group was set up with everything we needed. The cabin is situated on a beautiful plot of land surrounded by mountains just outside of Sparwood, BC. The Elk River runs right through the property and the views are stunning. We made use of the new hot tub and sauna sitting on the deck as well as the freshly renovated barn that was perfect for games or relaxing with a movie. The house was spotless upon arrival and all amenities were exactly as listed in the ad. Out of all the homes and properties that I've rented to date this one is by far the most picturesque. A lot of work has gone into the building and surrounding land and it shows. All in all a fantastic experience from start to finish. We will definitely be coming back in the summer to take advantage of some fly fishing! The natural setting of the ranch with the spring creek flowing by the deck, with the Elk River bordering the property and mountains all around, historic barn, etc., create a feeling that we love to share with guests. The new hot tub, cedar barrel sauna overlooking the creek, loft in the barn, abundant wildlife and other amenities make it ideal for groups like yours. We couldn't keep making improvements like these without loyal guests like you! Thanks for sharing your experience. This our 5th winter at the ranch with our family and it was another incredible visit. 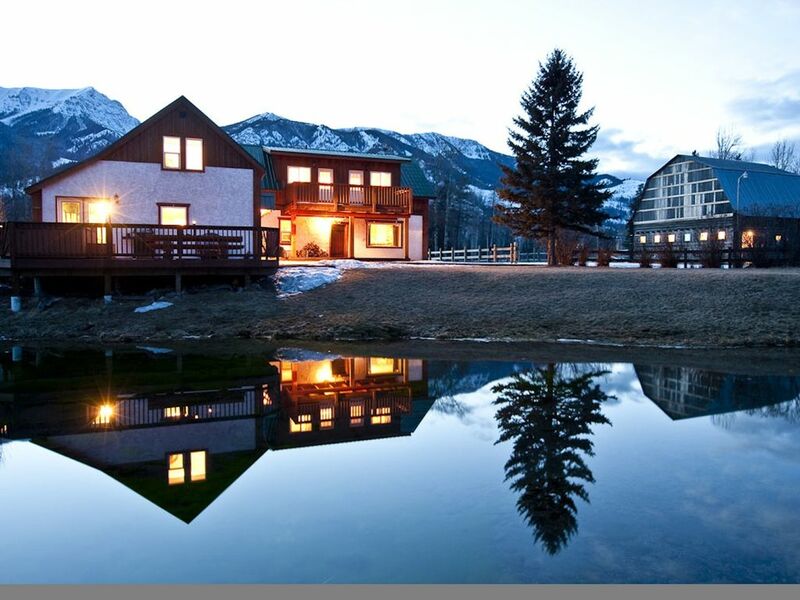 The rustic ambience and modern amenities of the ranch house nestled in the beautiful Rockies makes it such a special and memorable place for our family get togethers. Can’t wait to come back next year! Thanks Arnie for coming back 5 years in a row!!! You and your family have been a huge help for us to continue improving the lodge and setting every year. We couldn't do it without our loyal repeat guests like you. It means a lot, when we have guests as well travelled as you, to hear that you'll be coming back. We've always strived to have something truly unique in the world, an experience to remember. Thank you. We'll look forward to your return...and it will be even better with the constant improvements made possible by guests like you. A great get away. The house is very comfortable. Lots of room for everyone. Ages 1 1/2 to 83 and we all loved it. No matter where you look, the views were amazing. Mountains in front and mountains in back. Thank you Jason for sharing this beautiful home of yours. Our dream has always been to share this incredible ranch...the herds of elk, the trout stream flowing right outside, the historic feel, comfort and unmatched amenities...to bring families together and create memories they'll always cherish. Thank you for helping us make that possible. This is an absolutely fabulous piece of property. This is the second time we have rented this property for a fishing trip. We enjoyed every aspect of the house. Comfortable, spacious and clean with great wood burning fireplace and the added bonus of a foosball table. The six of us agreed that we would definitely book this again. We would find it hard to find such a better place to stay when in the Fernie area. Thanks Scott. The privacy and ability to walk and wade straight from the ranch is what hooked me to the ranch years ago. You'll enjoy it even more next year with a new outdoor Sauna and hayloft in the barn converted to a huge game room. We're constantly striving to make Elk River Lodge the absolute best place to stay in the Canadian Rockies and couldn't do it without guests like you. Elk River Lodge está localizado em um belo rancho 90+ hectares delimitada pelo Rio Elk oferecendo classe mundial a pesca com mosca seca e observação da vida selvagem em linha reta a partir da propriedade. Originalmente construído em 1906, o lodge foi cuidadosamente restaurado, com móveis personalizados por toda parte. For parties larger than 10 people, a rate of $65 per person over 10 applies per night. Special events such as weddings are priced on a customized basis.